The Southshore Theatre Company, comprised of current students and alumni, presents its first production. Tickets are Rs. 300 each and available at Southshore from Monday, July 18th. All proceeds will be given to AURA (Al Umeed Rehabilitation Association), an NGO which works with children affected by cerebral palsy (www.alumeed.com). Taleem-e-Balghan’ has no equal when it comes to quality comedy dramas. 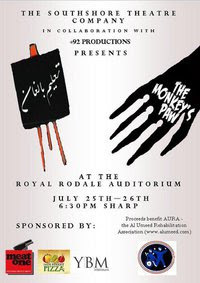 A play about students studying under the watchful eyes of Maulvi Sahab. The slightest act of indiscipline invites a beating from Maulvi Sahab who carries a flexible whipping stick that could be mistaken for his third arm – he is that comfortable using his stick and uses it to good effect. But you can’t maintain discipline for long with students of such diverse vocations (barber, butcher, milkman, landlord etc) all studying together under one roof – with the result that the stick features more than any of the actors in this play.